Striker Mark Jones in high-kicking action for Peterborough Sports during their 3-1 win over Newport Pagnell. Photo: David Lowndes. Peterborough Sports stormed four points clear at the top of the United Counties Premier Division yesterday (September 17), following a game which included a fine piece of sportsmanship from visitors Newport Pagnell. Sports were leading 1-0 through a Mark Jones goal when goalkeeper Luke McShane kicked the ball out of play so a team-mate could receive treatment for an injury. A Pagnell player tried to return the ball to McShane, but accidentally kicked the ball into an empty net. Dan Banister is on the floor during Peterborough Sports' win in the top-of-the-table United Counties Premier Division clash with Newport Pagnell at PSL. Photo: David Lowndes. The referee had no choice but to allow the goal, but Pagnell promptly allowed Jones to walk the ball into the back of their net from the kick-off. Jordan Macleod added a third goal deep into injury time to finally settle a high quality game between the top two in the Division. It was a good day for Sports who saw unbeaten rivals Holbeach United drop points at home to Oadby. All the goals in a competitive 2-2 draw at Carter’s Park arrived in the opening 30 minutes with Holbeach twice fighting back from behind with goals from Spencer Tinkler and Jake Clitheroe. Clitheroe felt he should have been awarded a late penalty, but the Tigers are now four points behind Sports in thrd, albeit with a game in hand. Yaxley, Deeping Rangers, Wisbech Town and Peterborough Northern Star were all beaten in the top flight. Phil Stebbing gave Yaxley an 11th-minute lead at undefeated Sileby, but the home side hit back to win 3-1, while Deeping went down 1-0 to a second-half goal in a hard-fought contest at Eynesbury. Wisbech and Star were beaten comfortably at Harborough and Leicester Nirvana respectively. Star had beaten Nirvana at home recently. Two-goal Mark Jones flies through the air during Peterborough Sports' 3-1 win over Newport Pagnell. Photo: David Lowndes. In Division One, Zak Munton’s goal gave Bourne a big scalp in Raunds. The visitors to the Abbey Lawns had lost just once before this season. Scott Ginty’s penalty gave Blackstones a point from their trip to Irchester, but Whittlesey Athletic left their Feldale Field fightback against Potton too late. Potton led 4-1 with 20 minutes to go before hanging on at 4-3. Kev Gilbert, Joe Butterworth and Liam Harrold scored the Whittlesey goals. Spalding head Division One South of the Evo Stik Northern Premier Division after winning 3-2 at Market Drayton. That’s now five wins and a draw from six league matches. Early goals from Sam Downey and Andrew Wright gave the Tulips a 2-0 lead which prolific marksman Brad Wells extended in the opening stages of the second half. Wells is the top goalscorer in all three divisions of the Evo Stik League with eight goals. 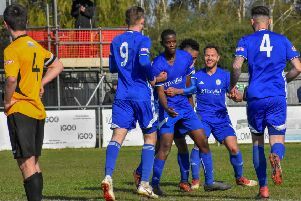 Stamford have made it into Monday’s (September 19) draw for the third qualifying round of the FA Cup, but they are still smarting at conceding a 97th-minute equaliser from the penalty spot at Gresley in yesterday’s second qualifying round tie. Elliott had shot the Daniels in front in the first half following fine work from Jevani Brown. The replay will take place at the Zeeco Stadium on Tuesday (September 20, 7.45pm). March Town United conceded an 86th-minute equaliser in their Thurlow Nunn Eastern Counties Division One match at home to Needham Market Reserves. Goals from Adam Conyard and Matt Cox had overturned an early deficit. Gresley 1, Stamford 1 (Sandy). March Town United 2 (A. Conyard, Cox), Needham Market Res 2. Wisbech St Mary 1, Whitton United 0.